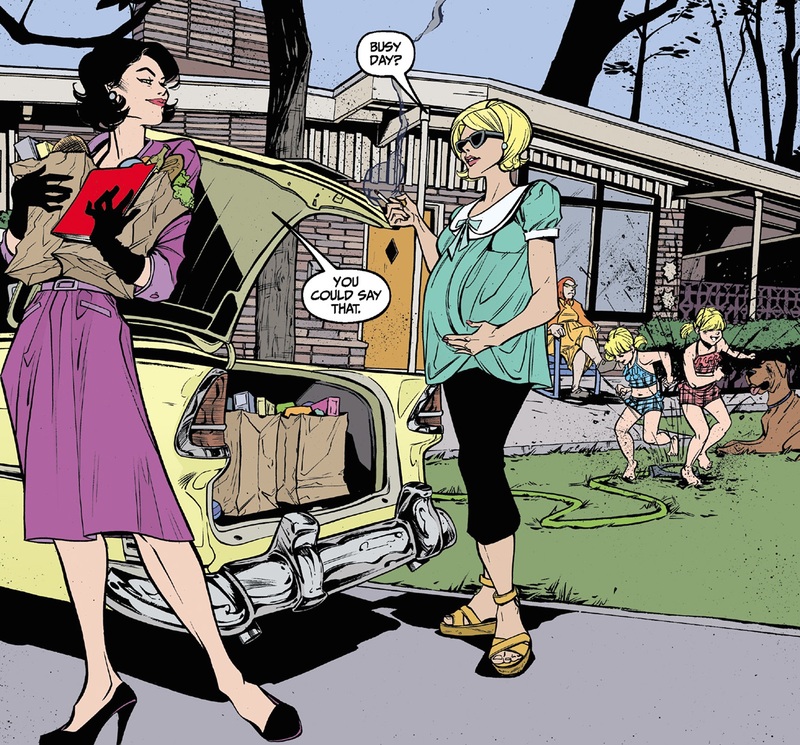 If you enjoyed the suave sophistication of the Mad Men television show but wish it had a femme fatale element to it, then Lady Killer is definitely a comic worth looking into. This comic is a very impressive because I love the retro feel of the art but also the beautiful way it depicts violence. Our main character, Josie Schuller, is the perfect 1960s housewife, except she is carrying a fifteen-year long secret; she’s an assassin. In issue two she starts working a “job” at a Kitty Kat club in order to lure a target away long enough so she can handle her “business”. Nobody has been able to get close enough to succeed at the contract, so her boss sends her in to use her womanly ways to get near him and, of course, Josie does. Joelle Jones skill for capturing such a time piece period and blending it so well with the brutality of the scene to make it look horrifically beautiful is exceptionally impressive. The artist is able to have Josie murder in such a way and still look stunning, her posture and form are always prim and proper. Even if she isn’t perfectly put together she still manages to clean up quickly and explain it away as something more innocent based on her ability to appear completely naive. Josie always finishes what is asked of her so far in her career but she is also torn. Her boss wants her to “move up” in the company but she is content and wants to be able to continue her alternate lifestyle. Which is just to be a normal sixties housewife managing the tug and pull of raising two children, whilst still trying to get dinner on the table for when her husband comes home and handle a live-in mother-in-law who is slightly suspicious of what she actually does when she leaves the house. 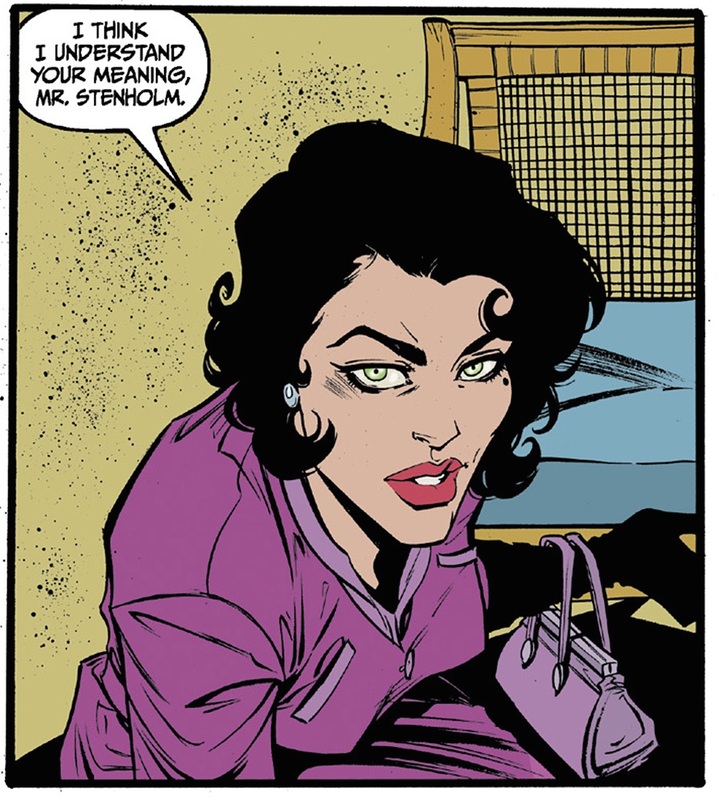 Lady Killer has the beginnings of a much deeper story, despite the art alone being enough to keep you looking. It is even more perfect because it portrays that any woman can have it all, a husband, children and a career, especially a badass one like being a beautiful unassuming cold-blooded assassin. With the advent of a new mission and a chance to advance one aspect of her life, the pressure escalates and she is challenged more than ever before. How important is her family and children to her? Can she actually make the impossible choice? The reason why this book is so impressive is that it makes you take a second very hard glance at the elegant and sophisticated Josie Schuller.